Tantalize your taste buds with Win Sum Dim Sum Microgamings new slot game that is a feast for the eyes. 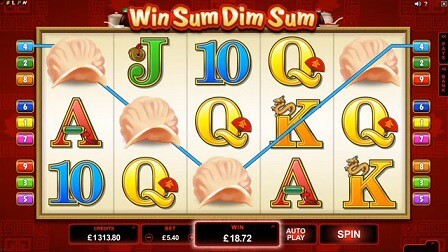 Win Sum Dim Sum is a 5 reel slot game with 9 paylines, the reels are packed with steaming hot dim sum that looks good enough to eat. The base game of Win Sum Dim Sum has an expanding wild on the third reel, this will boost your chance of creating winning combinations. When you unlock the Free Spins bonus the expanding reels will increase to three reels – that’s triple the chances. You can unlock the Free Spins feature by getting 3 or more scatter symbols across the reels.